"Meowlo, my future loving forever family! My name is Belinda, and I am so grateful that you took the time to read my profile. I am a female black and tan tabby kitty that is a sweet as she is beautiful!" "I am a very affectionate, playful lady who was found as a stray, and the amazing people who found me knew that Wayside was the place for me to find my forever home. Though my time here has been wonderful I am ready to have my own place with my own loving family, and I am hoping that family and home will be with you! I love to give and show attention but I can get so overjoyed when petted that I would be a good fit in a home with only adults. My felineality is executive; which means that I am very busy kitty! I will explore every room and closet to make sure everything is in it's place, then I will make sure the birds out the window are behaving themselves. Even though checking to make everything is okay will be a big job I will always have time to fit in nap time and snuggle time! Since I am a explorer by nature I do like to keep my paws on the ground, and prefer not to be picked up and held. I would love the chance to meet you so please come down. If you are looking for a companion that is curious, talkative, playful, sweet, and a huge lap and shoulder cat then we are soul mates! 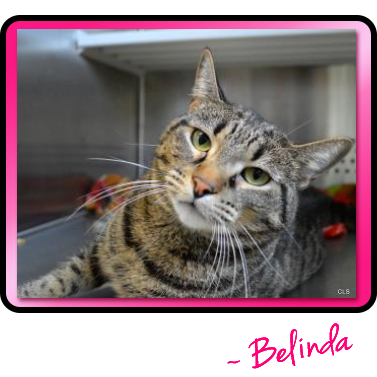 Belinda is available at Allie's Alma Mater, Wayside Waifs. Belinda is a cutie! Good luck finding a great home, but it should be easy for a pretty girl like her. Belinda, you are just the cutest girl! Good luck sweet Belinda and we so hope you find your forever home really soon. Have a wonderful Wednesday.